This week we are releasing a few new products and services. We begin with the Arduino Ethernet and the Arduino Mega ADK. The Arduino Ethernet combines a regular Arduino board with the Ethernet Shield into a single board designed to power your internet of things projects. It has the ability (if fitted with an optional module) to be powered directly from the ethernet cable using a standard called “Power over Ethernet“, this makes ideal for permanent installations in buildings and similar structures. For example, prototypes of the board have been installed and have been operating for over a year at the “Campari Gallery” museum in Milan Italy relaying sensor data via OSC to video players and other interactive installations with amazing reliability. You can use any FTDI compatible cable or module to program it. For this purpose we are also releasing a new USB2Serial module that is based on the same circuit that’s used in the Arduino UNO, hacking the firmware on the atmega8u2 will allow you to make amazing stuff with this cheap module. 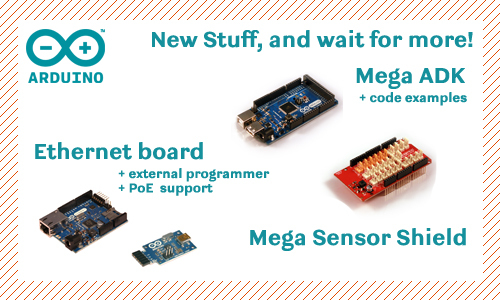 The Arduino Mega ADK is an exciting new addition to the lineup. Google recently released an Arduino-derived open source accessory development kit (ADK) for Android phones and tablets. This is our take on the platform. It’s essentially an Arduino Mega 2560 with the addition of a USB Host chip that communicates with the phone and a beefy power supply (the board needs to be able to charge the phone). The communication is implemented using Oleg Mazurov’s USB Host library. The ADK Sensor Kit makes it incredibly simple to develop with the ADK because there is no need to know anything about electronics, small modular sensors and actuators plug on top of the Mega ADK letting you create protoypes or robust installations in minutes! Later this week we’ll release a few code examples that will make it very easy for anyone to build Android accessories with Arduino. We hope you enjoy our new creations. i´m interested in arduino mega adk kit for android, how can i get one? Is there a tutorial to get started on using the arduino mega ADK ? Especially a tutorial to connect the Arduino ADK with the Android phones ? At the Arduino barcamp in Oxford the possibility of being able to upload code to the arduino over ethernet was mentioned. Is this feature in the final product? The Arduino Ethernet is going to be a super hit board, amazing design. it is half the price compared to buying an Arduino and an Ethernet module..
We made one (in Spanish) with Arduino UNO + USB Host Shield but you can see the basics to understand how it works. Why don’t you make another one with the ADK? The developer that was hired to write the code never finished it so we are shipping with the standard bootloader. We’re going to release the unfinished code so that the community can fix it. Check this blog for the announcement. We are going to release a new bootloader with more features in a few weeks. The tutorials are coming. Next week we’re putting online a new website with some very interesting tutorials and more. We are also putting up a video tutorial and will be available through our youtube channel by the monday/tuesday ! So here comes an introdcutory video on how the ADK looks and works ! Are you going to share codes and / or write a tutorial? There is an application note as well as a tutorial we are putting together which explains the step by step procedure to get the board setup and running ! I will keep you posted once we have it ready to share. I like the Arduino Ethernet. I only see one problem, the interrupt line of the W5100 is not connected with ATMega. I use the Ethernet Shield and, in some projects, it is useful. You can buy it from the Arduino Store. Here. I have a question, is the Arduino MEGA ADK compatible with the standard ethernet shield, as the Arduino MEGA?